This A-line dress with V neckline is a beautiful and flexible gown suitable for any kind of special occasion. A layer of beautiful, floral lace covers wraps the bodice of this silky chiffon dress. 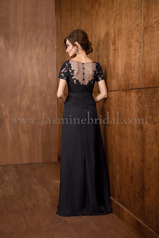 *Optional style number J165012X for fabric changed to Lace/Jade Tiffany Chiffon.